Fix a heart-healthy meal for your family using omega-rich tuna with low-sodium, fiber-filled beans and fruit on the side. From kitchen to table in 6 hours. Rinse dry beans well checking for any grit that might have been packaged with the beans. Place in a saucepan and cover with water and lime juice. Chop onions and add. Turn burner on to high and heat beans until water is boiling. Cover and reduce heat to the lowest setting. Cook for 5 hours stirring once or twice each hour and adding more water if necessary to keep beans completely covered. At the end of 5 hours cooking time, drain cooked beans in a colander. Return them to the pan and add fresh water to just cover beans. Dice tomatoes and add to beans along with canned tomatoes. Sprinkle pepper, cumin and Italian seasonings over the top and stir. 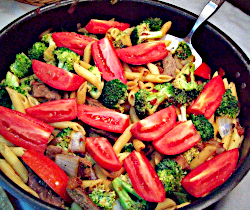 Cook over medium-low heat for another 30 minutes, stirring frequently and adding small amounts of water if necessary. Drain tuna and set aside. In a mixing bowl, whip eggs, mayonnaise and spicy mustard together. Add tuna and mix again. Chop celery and add to tuna along with pepper. Stir to blend. Using an ice-cream scoop, transfer tuna to skillet. Flatten into patties using a pancake turner. Cook tuna cakes until they are brown and crispy on one side. Flip and brown second side. 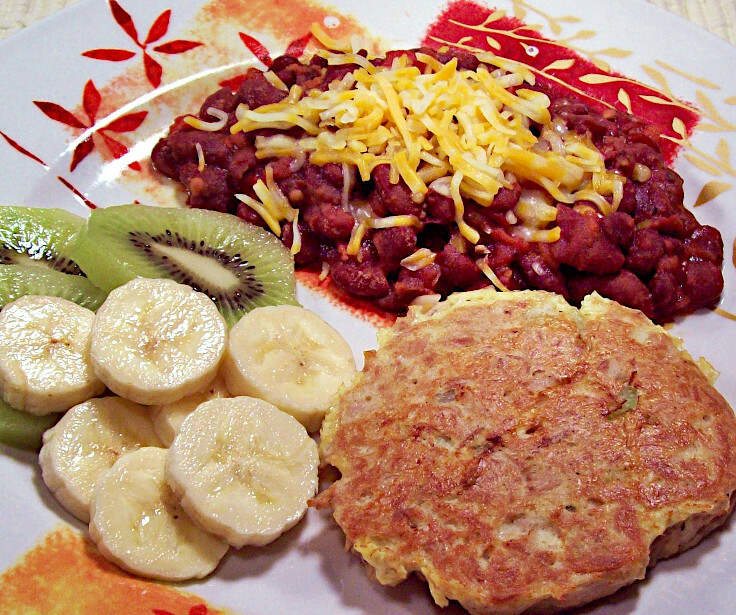 Serve with sliced fruit and cheese-topped beans.